There are several easy ways to test the performance of flame retardant fabric. Match test method can be assessed flame retardant fabric or relatively flame retardant properties. Take a test about 2.5cm * 30cm fabric, with a lit match on the bottom of the sample, burning to the match burn (or provisions 5-12S), observe the sample combustion or flame retardant effect. May require the burning time of the sample does not exceed 5 seconds as qualified, more than 15 seconds over the center line or smoldering time is unqualified. This law approaches vertical law. 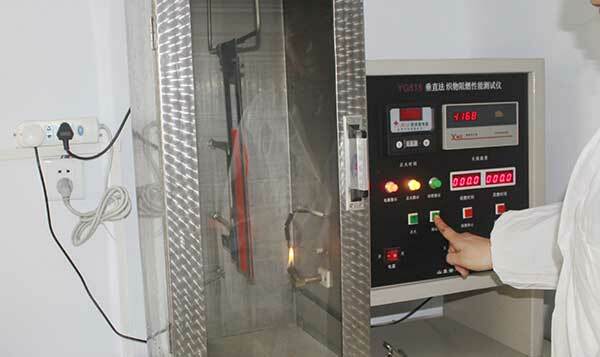 The sample size according to the test needs to be selected, the heat source using lighters, the time is generally 5 Seconds. Place the heat source and application conditions are similar. After the fire is extinguished, observe the spread of the flame spread is not serious as qualified. A stainless steel hexagonal nut (30 ± 2g) was heated in an electric furnace to 950 ° C. The nut was removed with a crucible pliers and immediately placed in the center of the specimen (300mm * 300mm). After 30s of contact, the nut was removed. The time required to record the flare burning time, the smoldering time, and the placement of the nut to the flashing point, on the edge of the impression ring, was recorded. The law applies to a variety of floor fabric testing. PREVIOUS POSTWhat Are The Main Factors Influencing The Color Fastness of Flame Retardant Fabrics?